Are Indochino's Accessories worth your money? Here's my opinion. For those like me who have known Indochino for more than a year, we got used to having deals that gave us 20% off, 2 free shirts and a free accessory - and deals like that were around pretty much all the time. It was because of this that the perceived value of Indochino's shirts and accessories was very low. You learned to wait with your purchase until a new coupon code came up and I don't think many of the Indochino regulars considered paying extra for a shirt, ties or other accessories. The nominal price of the shirts was 99$, the perceived value almost zero. Since then, the availability of coupon codes has changed significantly. It seems to be more profitable for Indochino to focus on Groupon deals instead - a new "150$ for 50$" deal has been popping up every other day for months and as it's an online deal, it's available for purchase for everyone from the US and Canada. The fact that customers from Europe and other regions cannot access these deals doesn't seem to matter much for Indochino (even if Groupon is present in many parts of Europe). This surely also reflects their business focus - they might ship everywhere, but mostly they sell to the US and their home country Canada. What does that mean for us customers? There are basically two things we have to consider here. First, Indochino raised the prices for suits considerably (and also upgraded the fabrics) in the last couple of months. Second, if you buy a suit for the nominal value of 500$, a Groupon deal will give you a 20% discount (I substracted 100$ not 150$, as you paid 50$ for the coupon). No free shirts, no free ties. So compared to, let's say half a year ago, Indochino does not only give less discount/less freebies, they also raised the prices. At the end this means we pay more and they earn more - fair enough, it's their goal as a company to earn a profit. It's just interesting to look back at what happened here. Furthermore, all this also had some effect on the perceived value and costs of their shirts and accessories. You can now get a shirt and a tie or cufflinks/tie bar for effectively 50$ (with a Groupon coupon worth 150$ that you paid 50$ for), but you can't get it for free anymore. On the other hand, one might argue that it's still a very good deal for a shirt and a tie (or a 2nd pair of pants for a suit). Now, let me get to the point why I originally started this article - are Indochino's accessories worth your money? It has to be said that fabric quality improved considerably over the last few months. The ties now actually also feel like they are made of silk. The construction is fine, the couple of ties I own don't have any loose threads or other problems. By the way, their Bow ties (except the classic bow tie - thanks Ryan) are not pre-tied. The selection is not bad and often new ties are introduced with the monthly new collections - some of them are very versatile pieces such as the solid colored or many of the dotted ties. Others have a very retro-inspired look and don't fit with every combination. It's obviously convenient to buy a suit and get a fitting shirt and tie at the same time - the price is fair too, I'd say. The ties are all pretty slim (2.75 inches), which is in line with current fashion trends, but not suitable for all body types. It also becomes clear that ties are not a priority for Indochino. For example it would be great to have some customization options, such as width, length or tip style available. Many of the Indochino Cufflinks look quite cool, they don't appear to be obviously cheap but it is also visible that they are not of very high quality (I talked to my brother, who is a goldsmith about it). If you ever come to Hong Kong or Shanghai you can buy them in bulk for a mere fraction of the price. I'm glad to see no "BMW logo" or the likes and some of Indochino's cuff links are of a very nice design. However, it would be nice to have some silk knot cuff links for example. The Indochino Tie Bar is quite alright, perhaps a bit too long for the slim ties. Overall, I bought those items because it's convenient to shop for everything at once, while you are at it. I'm not sure if it's the best value for money you can get, but as long as you don't expect the Indochino products to be pure, heavy sterling silver you will get some stylish pieces. The only Indochino Pocket Square currently available is the standard, white pocket square with the Indochino monogram. It's pretty cool though, I like simple pocket squares (and you can't go wrong with a white one). Indochino also usually has lots of different styles that come with the collection of the month and are of limited availability. Learn how to fold them here. 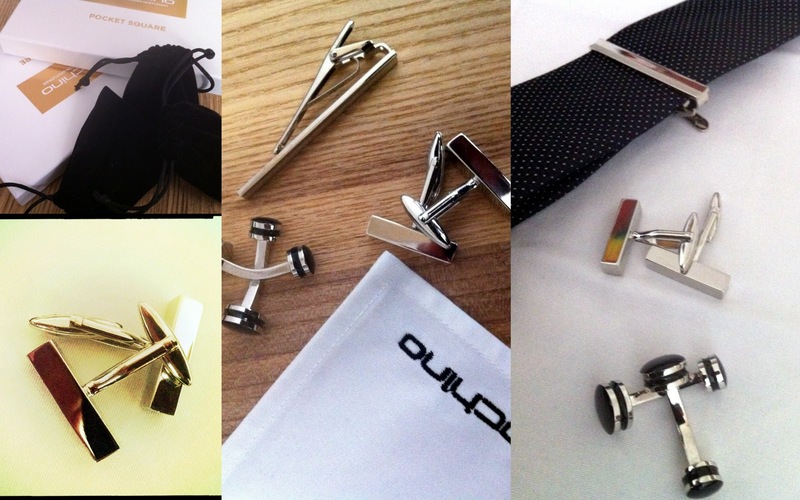 To sum up, accessories are not Indochino's core business or competency, but if you are in need of some cuff links, pocket squares etc. Indochino is probably a good place to start - especially if you have a Groupon coupon ready to use. For one coupon you can get quite a couple of cuff links, a pocket square and a tie bar to be ready for a stylish spring.